Chief Larak is the Orc warrior and chieftain of the Mor Khazgur Orc stronghold. He is a master shield-bearer and can thus train you in the art of Block up to skill level 90. As with many orc chieftains, Larak will challenge you to a brawl for the bet of 100 gold. He is the son of Sharamph, brother of Bagrak, father of Borgakh the Steel Heart and Olur and a husband to Shuftharz. 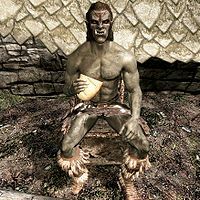 He wears fur armor with a pair of Forsworn boots and is armed with a leveled war axe and shield that may both be up to Orcish in quality. He also carries a pair of ragged trousers, the key to Larak's Longhouse and a selection of common loot and gold. He greets you with "You are speaking to Larak, chief of Mor Khazgur." He will also direct you to the other services available in the stronghold, saying "You should see my forge-wife, Shuftharz, if you need weapons or armor." and "My mother, Sharamph, knows many remedies you may wish to take with you." If you elect to train with him, he will remark "You wish to learn from the best, eh? So be it." He may also randomly remark on his position or his personal beliefs, saying "My place is chief and my challenge is to lead my people." or "I'm a strict follower of the old traditions. Honor, strength, deeds." His wife, Shuftharz, may mention her support for her husband, saying "The forge is strong and so is our chief, Larak. I'm content." Larak's sister Bagrak, however, seems to think he has not quite reached his full potential as chief yet, saying "Larak is strong, but he has much to prove as chief." Sharamph: "Malacath is pleased with your strength, Larak." Chief Larak: "I am honored." The game data notes Larak as 'InLawParent' and not as 'Parent' to both Borgakh and Olur, making it possible that Larak took in Borgakh and Olur as his own children. The game data marks Bagrak as a spouse to Larak, yet both Larak and Bagrak refer to Sharamph as their mother. Given that Orc women are married off to other outposts, it does seem strange that Bagrak would remain at Mor Khazgar if she is to be Larak's sister. Sometimes when he is sitting in the chair outside the longhouse, he does not interact with anything. ? He may not brawl you. ? This may be fixed by entering then exiting a building and trying again. This page was last modified on 5 November 2017, at 00:07.